"Went to space? I don't think so! Now pass the soy sauce." 3 3/4-inch scale action figure of Howard Wolowitz from The Big Bang Theory. Exclusive Howard cosplaying in a red Starfleet Operations uniform! Entertainment Earth Exclusive! This Bif Bang Pow! 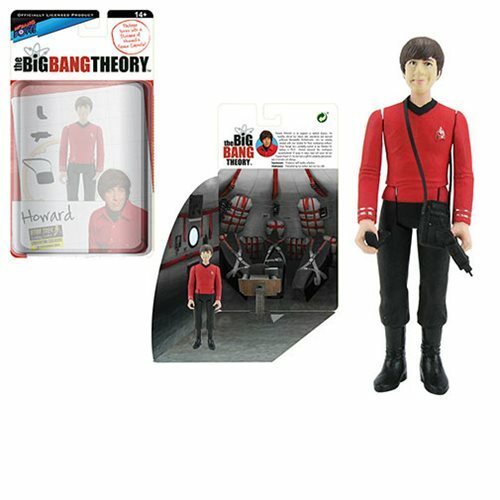 The Big Bang Theory / Star Trek: The Original Series 3 3/4-inch scale action figure Howard Wolowitz cosplaying in a red and black Starfleet uniform is inspired by another popular space engineer whom wore the same outfit. Also included are his very own Communicator, Phaser and Tricorder accessories. Howard Wolowitz is an engineer in applied physics. He recently retired his ‘ladies man' aspirations and married girlfriend Bernadette Rostenkowski, who he initially bonded with over disdain for their overbearing mothers. Even though he's constantly picked on by Sheldon for lacking a Ph.D., Howard achieved the prestigious accomplishment of going to space (and will never let his friends forget it). He also has a gift for celebrity impressions, and a horrible nut allergy.